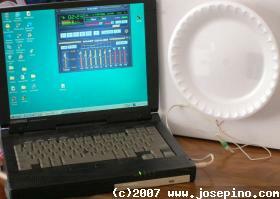 After I built my homemade speaker With a plastic cup, some people started to criticize it without even trying to build one. The worst rant was the "quality of the sound". Other people started to make their own homemade speaker based on my instructions without even giving me the credit as the original author, so I decided to build a new version, simple and better. When I said, "keep your socks up", I really mean it. I was working and doing some tests until finally I was able to build my own homemade speaker with the sound quality that competes with commercial speakers. As you can see on the picture, I did use a foam plate. I tried other materials and I found the best quality of the sound is produced by a lightweight material but strong enough to avoid excessive vibration. 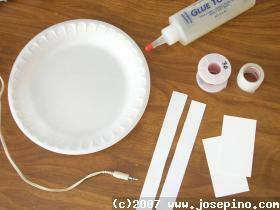 Paper plates are too soft, plastic disposable plates produces excessive vibration. First, roll one strip of paper over the magnet. Use tape. Do not tape the paper to the magnet. "It works! Love it... I used a ring magnet, and a plastic isolated wire, 70turns though. Beautiful sound... Love it." - Mindaugas from Lithuania. "I was so impressed by the quality of the speaker, it truly is commercial quality with a paper plate! I love it! - Ben from MI. "It took me a day but this works and the quality [of the sound] is AMAZING!" - Michael from Los Angeles. Roll the second paper strip over the first one. Do not tape the paper with the first roll. 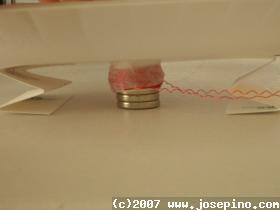 Remove the magnet after the paper cylinder is ready. 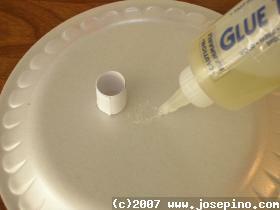 Glue the paper cylinder to the plate; try to glue it exactly at the center of the plate. 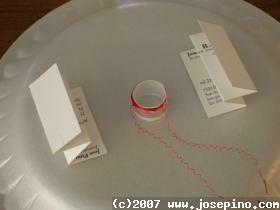 Start making the coil, keep the magnet inside so you don't crush the paper cylinder. Make about 50 turns of wire (AWG 32). If you don't have copper wire AWG 32, then use AWG 30 but be sure the coil has at least 7 ohms. 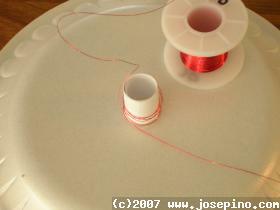 After you finish the coil, remove the magnet and the inner paper cylinder. 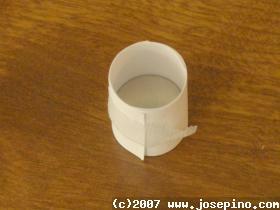 Discard the inner paper cylinder and try not to damage the second one. 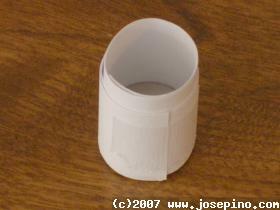 The inner cylinder is only used to create a gap between the magnet and the coil. 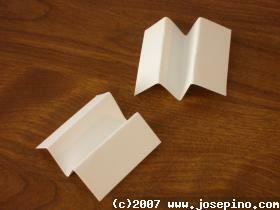 Fold the business cards as the picture shows. Now, put the plate so the business cards and the magnet stick to the base. The "base" can be a solid cardboard or wood. Anything flat and rigid works fine. I did use a cardboard. Using wood, the sound is better as wood vibrates less than cardboard. Check the wires, keep the wires away of the business cards or it may cause some noise and/or a rattle noise, so try to keen both wires separated. 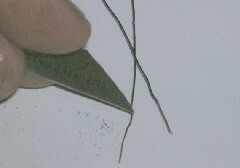 Remove the coating from the copper wire tip. I did remove about 1/4" of the enamel so the circuit will be closed when connecting the wire. Update: You can take the enamel off much easier with the flame of a lighter than a wire stripper or a razor. Thanks Gregg from WI & Thomas from papua new guinea for this tip! This step may help you to determine if the home-built speaker is working. 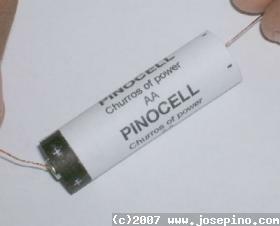 Just touch the sides of ANY AA or AAA battery with both ends from the speaker wire. Do not hold the wires, just touch the battery sides slightly. While doing this, the speaker should produce a noise. If there is no sound coming from the speaker that means the wire setup is not good or there is a short circuit. This diagram shows how it is connected to the plug. Using a Mono plug, just conect one end of the wire to the center connector and the other end to the side connector of the plug. If you are using a STEREO plug, just connect one end of the wire to the center of the plug and the other end to ANY of the side contact from the plug. Don't forget to remove the coating from the copper wire (Yes, I told you, it should be enameled copper wire. Just bare copper wire is not going to work. In case you are using a plug from cheap headphones, connect one end to the copper wire from the headphones cable and the other end to the red or white wire. Stereo headphones usually have three wires. After the glue dries, your homemade speaker is ready! You can make two if you want to have stereo speakers. I did plug my homemade speaker to my computer and I was satisfied with the result, the volume is good, the quality of the sound is really good, basically works fine like a commercial speaker does. Nothing touches the wires. The wires should move freely. The cards are completely glued, apply glue on ALL AREAS and no corners are left unglued. The coil should not touch the magnet. Try to make the coil wider. Also, the coil should not touch the base of the speaker. 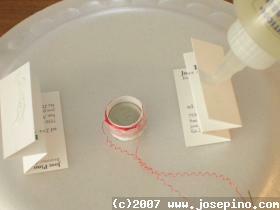 Try to glue the business cards closer or away from the coil until find the perfect location/volume. Be sure the business cards are parallel. Be sure nothing touches the foam plate, only the business cards should touch it. Some personal or portable audio devices doesn't have enough power to drive a speaker. Try many audio sources if you get no sound or the volume is low. Foam Plate I did purchase the foam plate from the supermarket. Any brand. Business cards... that is for free from anyone. Wire: I did purchase the wire from ebuy, (Dang! I don't get paid for this advertisement) Some craft stores sell the wire. You may even use the wire from old electronic parts if you have a background about electronics. Corrected, Thanks Quinten! Magnets: I did purchase it from the craft store. Ceramic magnets are ok, but the sound is louder using neodymium magnets. I do recommend neodymium magnets for better results. Some hardware stores sell those magnets. Square magnets are ok, just make the coil square. 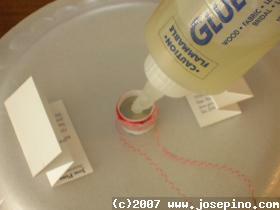 Glue: Buy it from anywhere, It depends of how long do you want to wait. 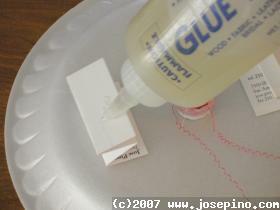 If you are willing to wait until the glue dries, use any kind. If you are some kind of crazy and wants everything done immediately (just like I'm), use hot glue or instant glue, but be careful! Your speaker will not work if your finger is glued on it. I have had a lot of fun using your instructions for making homemade loudspeakers for an art project. The speakers (or speaker objects) are just about to be exhibited in a show, and I have started to worry about the paper coils- I haven't thought about whether or not the coils will become too hot (over time), and perhaps be a fire hazard? Each playback session will be about five hours. Forgive me if this is a stupid question;-) I just need to know, and I thought you might know something about this. I hope to hear from you soon, and thanks so much for your instructions. Actually, it's a good question. Yes, Homemade speakers are a fire hazard if connected to hi-power amplifiers AND if it doesn't have enough turns. High currents will make coil hot and can burn the materials used. Low-power amplifier should be used (less than 2 watts) to avoid any fire hazard. If coil gets hot when using this homemade speaker, stop using it immediately. Even better: Do not build this project.